Tim Wilkerson catapulted himself to second place yesterday after he shot the day's best round, an 8-under 62 that put him at 11-under 199. Nobody expected anything out of Tim Wilkinson this week. As it so happens, neither did he. The PGA Tour rookie from New Zealand rode an 8-under 62 -- a career best and the lowest round on the PGA so far this year -- to stake his claim to second place at the end of three rounds of the Sony Open in Hawaii with an 11-under 199. When asked if he exceeded his personal expectations in only the third PGA event of his career, the 29-year-old hesitated. "Well, I didn't really have that many expectations, so I don't know if I exceeded them or not," Wilkinson said. "I wasn't really focused on how under par I was. Just wanted to hit good shots, and make some more birdies coming in." He played to his strengths -- accurate drives (11 of 14 fairways hit) and a strong short game -- to sink birdies on holes No. 1, 2, 6, 7, 9, 10, 11 and 18 with no bogeys. Attentive Hawaii golf fans might have noticed the 5-foot-7 Wilkinson looked a bit familiar; he was in fan-favorite Tadd Fujikawa's group -- and shadow -- over the first two rounds, playing well but flying below the radar with scores of 68 and 69. 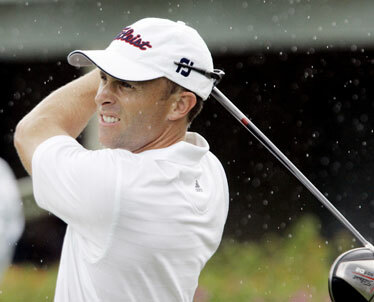 Wilkinson burst into the tournament consciousness with a score just one off the Sony Open record of 61, set by David Toms in 2006, and two off the Waialae course record of Davis Love III in 1994. The mark could have been attainable; the Q-school product was 10 under for six straight holes on the back nine, before tallying his final birdie on 18. "I'm not a flashy player by any means and not many people have heard of me," Wilkinson said. "But I try to improve every year ... to improve every part of my game. I think if I do, the results will come." Wilkinson is just one of 11 tour rookies who made the cut on Friday and are playing for their first paychecks as full-fledged members on tour. Dustin Johnson and Chez Reavie are tied for 14th at 7-under 203. All three of these guys have managed rounds in the 60s since teeing it up on Thursday. Brad Adamonis (204) is tied for 21st, and Matt Jones and Alejandro Canizares (205) are tied for 26th, still within 10 shots of the lead in their first extended action of the season. Three of the four Monday qualifiers are also in the field. They are Doug LaBelle II, who is tied for ninth at 8-under 202, Spencer Levin (208, T-46th) and Mitsuhiro Tateyama (211, T 65th). Of that group, Wilkinson, Jones and LaBelle managed bogey-free rounds. There are four main categories kept at each tournament for the week. They are driving distance, driving accuracy, greens in regulation and putting average. The leaders this week are J.B. Holmes in driving distance (335.7 yards), Fred Funk in driving accuracy (78.57), Chad Campbell in greens in regulation (85.19 percent) and Paul Azinger in putting average with 1.571 putts per green. The easiest hole yesterday was the par-5 ninth with a scoring average of 4.382. There were two eagles, 40 birdies, 24 pars and two bogeys yesterday as the overall scoring average was 69.265. The hardest hole was the par-4 16th with a scoring average of 4.176. There were no birdies, 58 pars, eight bogeys and two double bogeys, by Robert Gamez and Mark Calcavecchia. Dating back to 1983, there has never been a round where there were no birdies on any one hole. See scoreboard, B10, for Sony Open in Hawaii results.